Window Tint Film is an expensive, attractive, and efficient way to improve the interior and exterior quality of automobiles. It also provides a level of privacy from the outside world but more importantly, it protects the skin from hard UV light from the sun, reduces glare and reflection when driving, and helps keep the coolness inside of the car. Ceramic Film is the highest quality of window tint film in the market and usually the most expensive. It doesn’t contain metal, dye, or carbon, but instead it contains ceramic particles that are non-conductive and nonmetallic. Ceramic Film is one of the newest products in the window film market but it has already proven its worth in terms of performance and reliability. 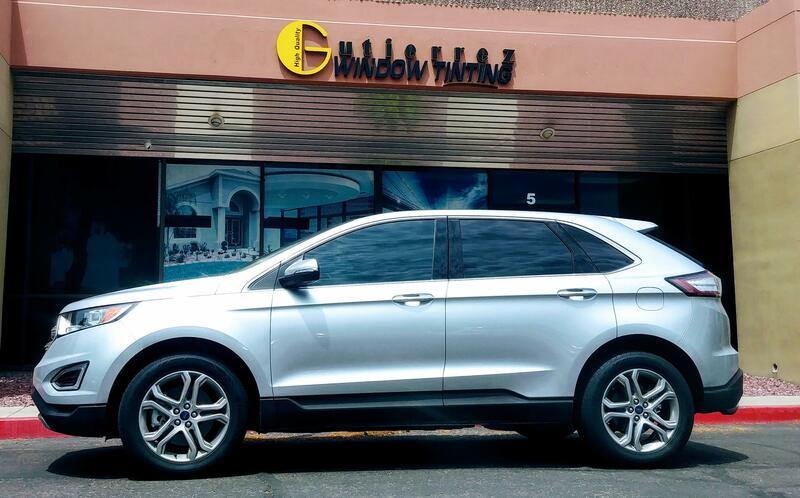 Ceramic Window Tint Film reduces the heat from the sun for about 55% to 62% while allowing maximum visibility during the day and night. Just like Carbon Film, it also allows maximum efficiency and function of radios, cell phones, GPS systems, and other electronic devices used inside of the property or vehicle protected with Ceramic Film. This window tint film also surpasses all other types of window film on resistance to glare, fading, and renders windows highly shatter-proof. 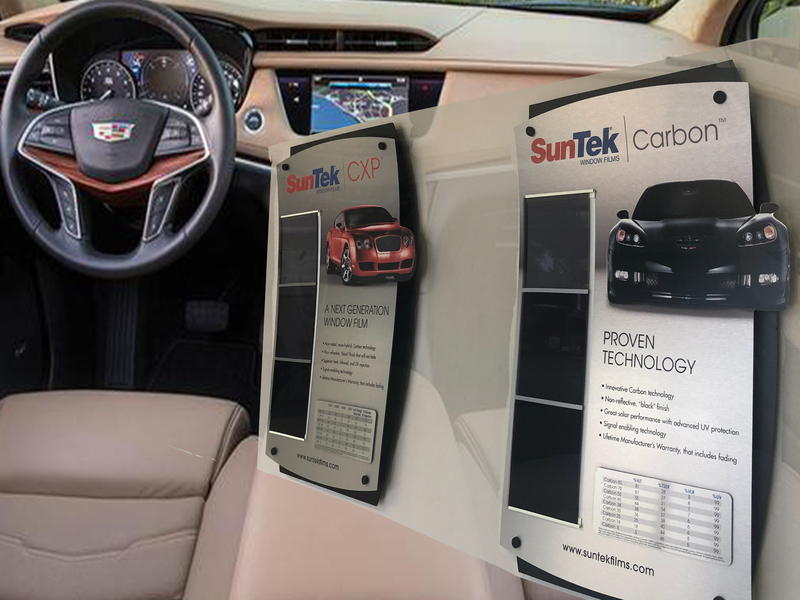 Lastly, because of the efficiency of UV protecting of Ceramic Film, it also protects the interiors of automobiles from the damage created by the sun UV light and makes your car interior last longer. Call us and ask us if Ceramic Window Tint Film is the right product for your car, usually we always recommend this material for luxury or new cars. Carbon window tint film delivers rather better results at a more affordable price than Ceramic Film. Carbon film doesn’t have any metal particles in it, therefore there are no problems in the performance of radios, cell-phones, and other electronics. Carbon window film is known for a dark appearance and matte-finished look, which provides a tasteful option on windows. The carbon particles blocks about 40% of the infrared light (the kind of light that causes warmth). Carbon window film offers almost the same standards as the other films in regards of blocking, protection, glare and duration at a lower price. The Car AC usage also improves and makes your system not work too hard to cool your car since the inside of your car won’t be too much affected by the UV light being blocked. Carbon film also has a long lasting appearance before it starts fading, making it a good long term investment. This is one of our films that is unique and very beneficial that we offer to our clients. Like dyed film, it keeps heat away from the interior space because of the metallic particles in the film. The metallic particles are visible to the eye by the shiny reflection effect in the film. One of the main benefits of metallic film is that it also makes car windows much more shatter-resistant in the event of damage or a crash. Metallized window tint film is mostly popular for its shiny appearance from the outside of the cars. However, as you can probably realize from our past 2 paragraphs, due to the metal particles in this films it makes sometimes harder to use radio, cell-phones, GPS systems, and other electronics when inside of the interior being protected. If you have more questions about the window films that we carry or which one to choose, we are here to help you and clear any questions or doubts.